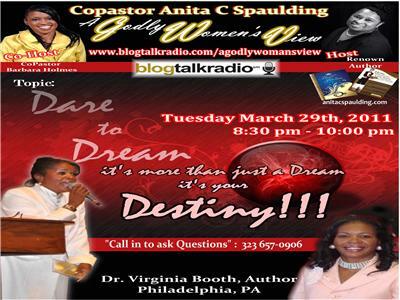 Guest Speaker, Dr. Virginia executes the love and grace of God by giving of herself as a mentor to many women. Her compassionate, heart manifested the establishment of a Mentoring Group” entitled, “DIVAS” which means “Divinely, Inspired, Victorious Audacious, Sisters” for ages 20-35, although she mentors woman above this age bracket. In the June 2008, Dr. Virginia established and became the founder of a non profit ministry, “Virginia Booth Ministries”Inc., a ministry that focuses on bringing healing, hope, and restoration to women of all age. (“Transforming the lives of Women from the inside out”) In time, Dr. Booth’s labor pains of passion excelled beyond women. It became so awe-inspiring until she birthed forth a phenomenal, life changing book entitled When Your Promise has Died. It’s a book not birthed for women only, but anyone who has had a dream and let it die.